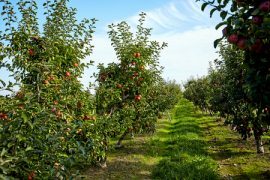 The Decision Aid System (DAS), which Washington tree fruit farmers use to predict when tree fruit will blossom, the best fruit size, and the best bee foraging times, is being updated and tested this year by Washington State University (WSU), which came up with the system in the first place. This will serve as a trial run of sorts for the model for growers, tree fruit company fieldmen, and chemical organizations, according to Vince Jones, the DAS director and a behavioral ecologist and entomologist for WSU’s Tree Fruit Research and Extension Center located in Wenatchee. Jones and his team developed and launched the DAS about a decade ago. The system uses historic and present day data from 175 weather stations to inform farmers on how and when to fight diseases and pests, with instructions specific to their area. The system also predicts blooming, storage scald, and sunburn damage. This new DAS model, based on heat units Jones calls degree days, was developed over four years with analyses that Jones completed this past fall. Between 2010 and 2014, Jones collected data by measuring 50 apples at a time, twice per week, at nine different sites across Central Washington. Jones stated there was a correlation in the relationship between these proportions and degree days. Jones’ goal with this new model is to figure out when produce has reached its full size, not full maturity. This helps farmers plan harvesting and gives them an idea of what to expect. The new DAS system even helps to predict when residue from pesticides will lessen. Data from this research also helped with budding and blooming development. This is meant give growers a better estimate regarding when to use pesticides and when honey bee pollination is ideal. To predict the ideal days for pollination, the DAS system factors in rainfall, wind speed, and solar radiation. This is based on a similar model created by Gloria Degrandi-Hoffman, who is an entomologist with the USDA-ARS Carl Hayden Bee Research Center in Tuscan, Arizona. “At this point, pollination is sort of an art. This should give growers a guide that tells them that even if they have the bees in for seven days, the best two for foraging,” Jones said. He and his team have also developed new models to predict the first and second generations of a tree fruit pest called San Jose scale.